What do reader’s fears become when they’re examined? Top-notch tales, poems, and images will horrify and delight readers in this anthology called What Fears Become. Each feature rips through reality plunging readers into frightful situations deep enough to provoke a bag full of nightmares. It is unlikely readers will set aside a single whisper-read word. Like stepping onto a monstrous scene, their wide eyes can’t look away. Thirty-one finely honed eager narratives, eighteen delicious poems, and eighteen visions touch all who dare venture inside. Besides penning horror fiction, the authors in this book are teachers, radio personalities, newspaper reporters, editors, gardeners, musicians, poets, reality TV contestants, aides at mental hospitals, technical writers, volunteers, graphic designers, inventory clerks, writers of chapter units for history textbooks, receivers of prestigious awards, founders of martial art systems and have had films produced from novels. The collection opens with “Bast,” by Christian A. Larsen, which is about a man who visits his dying grandmother. Can cats really take one’s breath away? Marty finds out in this eerie yarn. Descriptive. I have been a fan of The Horror Zine for some time now. Editor Jeani Rector and her crew work hard to provide a quality monthly literary journal with fiction, poetry, and artwork from morbidly creative people. When she contacted me about reviewing their first print collection, What Fears Become, I jumped at the chance. Read the rest of the review at RA For All Horror. This is a feast of horror, an explosion of ideas that reach into every aspect of the genre. The Horror Zine is the online magazine from which these stories are collected. The freshness displayed there carries through to this anthology. Jeani Rector has managed to attract many well known, respected writers in the field, most notably for me, Scott Nicholson, Graham Masterton and, of course, Ramsey Campbell with his particularly off-kilter brand of horror. These stories have that indelible mark and feel of professionalism that defines the genre at its best. Read the rest of the review on pg. 79 of the latest issue of Midnight Street Magazine. When I was a little boy running errands with my mom, she used to keep me interested with treats from her purse: a stick of Wrigley’s Doublemint (or if I was lucky, Juicyfruit), a Brach’s Starlight Mint, or maybe even a butterscotch candy. In much the same way, the tasty treats packed in Michael C. Keith’s anthology, Hoag’s Object, will hit the spot: sweet. Keith shows great attention to detail in the first tale, “Magic Skin,” as he transports the reader with the flight of Huru, an albino Tanzanian who is being hunted for the so-called magical properties of his much-lighter skin. Although I admit I’m no expert, he crafts a very believable portrait of a Tanzanian running for his life, complete with a breathing culture as a backdrop. With a few strokes of a brush, an artist does what Keith does with a few well placed words: “At sixteen, Huru had left Mama Lweza’s care to work alongside her brother Abasi in Kisessa, gathering sisal for rug makers.” Keith provides the bricks. Our imagination provides the mortar. My brother and I were given a set of ventriloquist dolls when I was young. Mine was W.C. Fields and his was Charlie McCarthy. 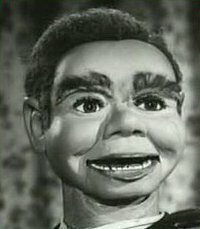 Not long afterward, I saw the Twilight Zone episode “The Dummy.” It didn’t take me long to see a strong similarity between the Willie in the episode and my brother’s Charlie McCarthy. I vividly remember hanging ol’ Charlie in a noose so he would strangle himself if he ever came to life, but it wasn’t enough and I used to wake up suffering the hysterical after effects of night terrors. Last I saw of either dummy, my dad was throwing them into the driveway in a garbage bag. They were re-gifted shortly thereafter, though what became of their new owners, I don’t know. I finally wrote a pseudo biographical short story called “His Splintery Smile” which is equal parts my experience as a kid and an unofficial sequel to “The Dummy”. Fans of the Twilight Zone will recognize that Willie’s hair was fluffy in the episode, and in my story, it’s wooden, but there was a reason for that which becomes apparent the further you read my tale. And the good news is, you’ll soon be able to read it in Fear and Trembling Magazine. I’ll let you know when I have a publication date. You are currently browsing the exlibrislarsen blog archives for October, 2011.